Harpist, composer, improviser, and educator Zeena Parkins joins host Derk Richardson in the studio, sharing her latest music, including her major composition Captiva–which she will perform Saturday night (Feb. 2) in a benefit concert at Mills College in Oakland–plus selections from herTriplicates duo with Jon Leidecker (aka Wobbly), a brand new mix of her piece “Tensor,” and who knows what else. The Mills concert (8 p.m., Littlefield Concert Hall) will also include improvisations with guitarist Fred Frith and percussionist William Winant. 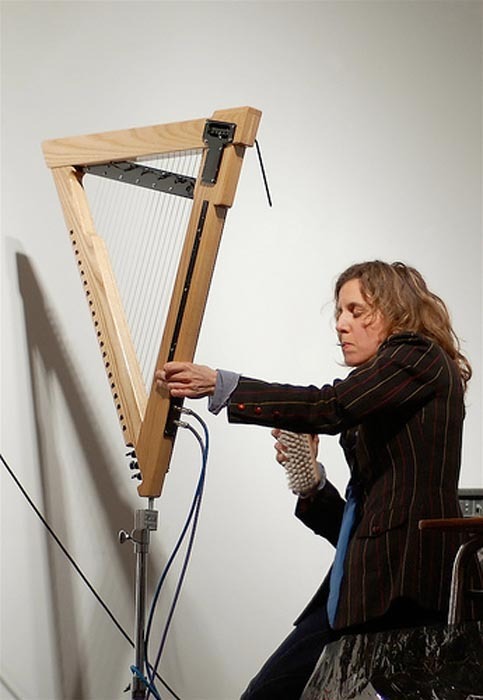 Zeena Parkins Distraction (Traveling for S. Hiller) Tensor Mix v.4 CD-r n.a. Miles Davis & Michel Legrand The Dream Dingo Warner Bros.